Discover tree climbing and experience a unique, exciting adventure suitable for ages 8 + the magic thrill of tree climbing is perfect for all. 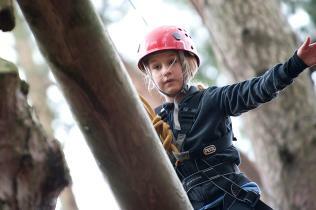 Get back to nature and climb up into the trees as you see Avon Tyrrell from a new perspective. After learning the skills to ascend the ropes, participants have freedom to go as high as they want, to experience new sensations, perspectives and challenges. . Once you’re in the canopy, you can enjoy beautiful views and relax or challenge yourself to climb as much as you want to. As well as being able to enjoy a great fun session you can also learn about the trees, estimate their height, or even try tree orienteering! 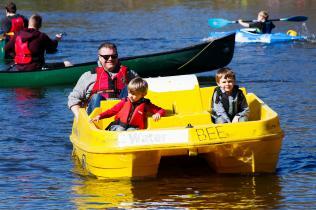 Our maximum weight limit for this activity is 16 stone. Weather appropriate clothing, be this your waterproof or sun hat and sun cream. Skill: By working together this session promotes skill acquisition, communication and cooperation. Personal Challenge & Achievement: Individuals receive high levels of encouragement from our experienced instructors, so that they have the opportunity achieve their goals and understand more about themselves and their own personal state management. Support & Cohesion: By taking part in a shared experience, Tree Climbing can improve group and leader familiarisation as individuals work closely together. Individuals are also encouraged to support one another both verbally and physically, so individuals can challenge themselves to their personal limits. Fitness & Wellbeing: This activity by the nature of its physicality and location promotes an appreciation of the benefits of the outdoors for wellbeing and fitness. When incorporated as part of a development programme of activities, outdoor learning activities such as tree climbing can support increased attainment and develop character and soft skills all of which are key life skills. Individuals will be able to recognise their own achievements and individual progression, as well as have the opportunity to develop personal qualities such as self-reliance, perseverance, self-belief and increased levels of confidence. As well as being adapted to suit your group and their specific learning objectives, Tree Climbing can support key areas of the curriculum.